Jan Just Witkam's Islamic Manuscripts website is an invaluable trove material to scholars who work with manuscripts in Arabic script. The Loghatnāme of Ali Akbar Dehkhoda, originally compiled in the 1930s, continues to be the most comprehensive Persian dictionary ever published. While Dehkhoda in print occupies the better part of a large bookshelf, the recent iOS and Android applications make the dictionary more accessible than ever. Francis Steingass' (1825-1902) Comprehensive Persian-English Dictionary remains the most thorough Persian-English dictionary for pre- and early Modern Persian literature, despite its several flaws. Noormags (Pāygāh-e Majallāt-e Takhaṣṣoṣī-ye Nūr) archives hundreds of difficult-to-access scholarly journals from Iran, allowing free of charge full-text access. The Perso-Indica project seeks to provide a survey of Persianate engagement with Indic thought from the 13th to the 19th centuries. The Cambridge Shahnama Project provides a comprehensive collection of Shahnama manuscript illustrations from around the world. Afsaneh Najmabadi's wonderful Women's Worlds in Qajar Iran Digital Archive provides a wonderfully rich material archive which brings to life aspects of everyday life in Qajar Iran. Bibliographia Iranica is Professor Houchang Chehabi's very useful annotated bibliography of scholarly works related to Iranian Studies. The Packard Humanities Institute hosts a very useful collection of searchable public domain English translations of Persian texts. The International Society for Iranian Studies (ISIS). The Association for the Study of Persianate Societies (ASPS). Iranian Studies at Harvard University consists of useful primers for studying Iranian religions and languages designed by Prods Oktor Skjærvø and Wheeler M. Thackston. The Avesta Digital Archive is a repository of digiitalized Avestan manuscripts collated by the team at the University of Salamanca. The TITUS archive stores a tremendous amount of transcribed texts in Indo-European languages, including much of the Avestan and Pahlavi corpus, as well as texts in other Iranian and non-Iranian languages. Avesta.org is a useful compendium of out-of-copyright translations from Zoroastrian texts (mostly drawn from the Sacred Books of the East translations of E. W. West, James Darmesteter, and Lawrence Mills). The UNESCO Parsi Zoroastrian Project (Parzor) has done amazing service to the field of Parsi and Zoroastrian studies through its numerous initiatives. The Societas Iranologica Europaea (SIE). Achemenet is a virtual museum of all things related the Achaemenid Empire maintained by Professor Pierre Briant. Sasanika is a website devoted to all things related to the Sasanian Empire maintained by Professor Touraj Daryaee. Abstracta Iranica is a bibliographical review of various publications in Iranian Studies. The Digitales Turfan-archiv is a repository of digitalized manuscripts recovered during the archaeological excavations at Turfan. International Dunhuang Project is an international collaborative project to bring online materials related to Dunhuang and the Eastern Silk Road. The Digital Library of India (DLI), despite its somewhat opaque interface and irregular transliteration, provides access to tens of thousands of very rare Persian, Gujarati, Hindi, and Urdu-language texts. The DLI currently operates two websites, one in Pune and the other in Banglore. An older site in Hyderabad (now defunct) is still partially archive at the Osmania University Digital Library. While the Pune site generally has the largest collection, it is always worth searching all three sites. In my opinion, the easiest way to download from these sites is to use a download manager like Firefox's Downthemall, but tools specifically for downloading DLI books exist as well (see here and here). The K. R. Cama Oriental Institute (incorporating the Mulla Firoze Library and the Manekji Limji Hataria Library) (Mumbai) possesses the world's largest collection of Zoroastrian manuscripts. Rehatsek, Edward. 1873. Catalogue Raisonné of the Arabic, Hindostani, Persian, and Turkish MSS in the Mulla Firuz Library. Bombay, Mulla Firuz Library. Brelvi, S. A. & B. N. Dhabhar. 1917. Supplementary Catalogue of Arabic, Hindostani, Persian, and Turkish MSS and Descriptive Catalogue of the Avestan, Pahlavi, Pazend, and Persian MSS in the Mulla Firoz Library. Bombay, Mulla Firoz Library. Dhabhar, B. N. 1923. Catalogue of the K. R. Cama Oriental Institute. Bombay, Fort Printing Press. Dhabhar, B. N. 1923. Descriptive Catalogue of Some Manuscripts Bearing on Zoroastrianism and Pertaining to the Different Collections in the Mulla Feroze Library. Bombay, Fort Print Press. The Managing Committee of the Mulla Feroze Library. 1928. The Mulla Feroze Library: Author's Catalogue of Printed and Lithographed Books and Some Manuscripts with a List of Newspapers and Other Miscellaneous Papers. Bombay, Fort Printing Press. Gharavī, Mahdī. 1986. فهرست نسخه‌های خطی فارسی . بمبئی - مؤسسۀ کاما - گنجینۀ مانکجی (Fihrist-i Nushkhahā-i Khattī-i Fārsī: Bambaʼī - Muʼassasa-i Kāmā - Ganjīna-i Mānikjī). Rawalpindi, Markaz-i Tahqīqāt-i Fārsī-i Īrān va Pākistān. The First Dastoor Meherjirana Library (Navsari) possesses the world's second largest collection of Zoroastrian manuscripts. Dhabhar, B. N. 1923. Descriptive Catalogue of All Manuscripts in the First Dastur Meherji Rana Library, Navsari. Bombay, Commercial Printing Press. Kotwal, Firoze M., Daniel Sheffield, & Bharti Gandhi. 2008. Preliminary Descriptive List of the Manuscripts Donated to the First Dastur Meherjirana Library since 1923. Published online. The University of Mumbai Library (Mumbai). Banaji, F. K. 1901. Catalogue of the Library of the University of Bombay. Bombay, Times of India Press. Sarfarāz, Khān Bahādur Shaykh ʻAbd'u-l Ḳāder. 1935. A Descriptive Catalogue of the Arabic, Persian, and Urdu Manuscripts in the Library of the University of Bombay. Bombay, Qayyimah Press. ʻAbd al-Muqtadir and Muhammad ʻAbd al-Khallāq. 1925. فهرست نسخۀ خطی فارسی اورینتل پبلک لائیبریری ، بانکیپور مسمی بمرات العلوم (Fihrist-i nuskha-i khattī-i Fārsī-i Oriental Public Library, Bānkīpūr, musammá bi-Mirʼāt al-ʻUlūm). Patna, Sādiqpūr Press. Minocher-Homji, Nadirshah Dorabji. 1921. "First Report on the Search for Avesta, Persian, and Arabic Manuscripts." Annals of the Bhandarkar Institute 2: 201-212. Cereti, Carlo. 1996. "Zoroastrian Manuscripts Belonging to the Bhandarkar Institute Collection, Pune." East and West 46: 441-451. Rieu, Charles. 1879-1883. Catalogue of the Persian Manuscripts in the British Museum. London, Trustees of the British Museum. Dhalla, M. N. 1912. "Iranian Manuscripts in the Library of the India Office." Journal of the Royal Asiatic Society Apr. 1912: 387-398. Ross, E. Denison & E. G. Browne. 1902. Catalogue of Two Collections of Persian and Arabic Manuscripts Preserved in the India Office Library. London, Eyre and Spottiswood. Blumhardt, J. F. 1892. Catalogue of Marathi and Gujarati Printed Books in the Library of the British Museum. London, Trustees of the British Museum. Blumhardt, J.F. 1915. A Supplementary Catalogue of Marathi and Gujarati Books in the British Museum. London, Trustees of the British Museum. Blumhardt, J. F. 1908. Catalogue of the Library of the India Office: Marathi and Gujarati Books. London, Eyre and Spottiswood. Edwards, Edward. 1922. A Catalogue of the Persian Printed Books in the British Museum. London, Trustees of the British Museum. Sachau, Edward & Hermann Ethé. 1889. Catalogue of the Persian, Turkish, Hindûstânî, and Pushtû Manuscripts in the Bodleian Library. Oxford, Clarendon Press. Blochet, Edward. 1900. Catalogue des manuscrits mazdéens (zends, pehlvis, parsis et persans) de la Bibliothèque Nationale. Besançon, Paul Jacquin. Blochet, Edward. 1905-1934. Catalogue des manuscrits persans de la Bibliothèque Nationale. Paris, Imprimerie National. Cabaton, A. 1912. Catalogue sommaire des manuscrits indiens, indo-chinois & malayo-polynésiens de la Bibliothèque Nationale de France. Paris, Ernest Leroux. Westergaard, N. L. & A. F. Mehren. 1846. Codices Orientales Bibliothecæ Regiæ Havniensis. Copenhagen, Berling. Asmussen, Jes P. "Codices Hafniensis." In Encyclopedia Iranica. Bartholomae, Christian. 1915. Die Zendhandschriften der K. Hof- und Staatsbibliothek in München. Munich, Palm'schen Hofbuchhandlung. Digitalized Avestan, Pahlavi, and Persian Manuscripts. HOLLIS Catalogue. Browse by call number for MSS Persian 44-61 & MSS Indic 2535-6 . Amordad News (امرداد تارننمای خبری زرتشتیان) is Iran's foremost news site for the Zoroastrian community and a wonderful resource for all researchers of modern Zoroastrianism. Hamazoor is another important source of Iranian Zoroastrian news. The Tehran Zoroastrian Anjuman website also carries frequently updated news items, as does the website of Mobeds' Anjuman of Tehran. Parsi Khabar is an amalgamator of news items relating to Parsis and Zoroastrians from various sources, updated frequently. The Bombay Parsi Panchayat (BPP) publishes a monthly review. Parsiana is a stalwart biweekly publication of the Parsi community under the edtiorship of Jehangir Patel. The site also maintains a very useful bookstore. Hamazor, the quarterly publication of the World Zoroastrian Organization, whose back issues can be found here. The Fedearation of Zoroastrian Associations of North America publishes a bimonthly journal. The Bombay Samachar is the oldest continuously run vernacular newspaper of India. The Jam-e Jamshed is another of the oldest newspapers of the Parsi community. The reformist Zoroastrian organization Association for Revival of Zoroastrianism (ARZ) maintains its page here. The Association of Inter-Married Zoroastrians (AIMZ) page can be found here. The Zoroastrian Youth for the Next Generation (ZYNG) page is here. To keep up with the orthodox, conservative Parsi opinion, see the World Alliance of Parsi Irani Zarthoshtis (WAPIZ) page. Ervad Marzban J. Hathiram maintains a blog about Ilm-e Khshnoom, often including rare photos and details about rituals here. The site also maintains a digital library of khshnoomist books. Parsee Voice, a very conservative khshnoomist journal, is hosted on the equally conservative Traditional Zoroastrianism site. Touraj Daryaee's personal webpage and blog. Khodadad Rezakhani's webpage and blog. Shai Secunda's Academic Talmud blog. The Ancient Iran and India Trust blog. 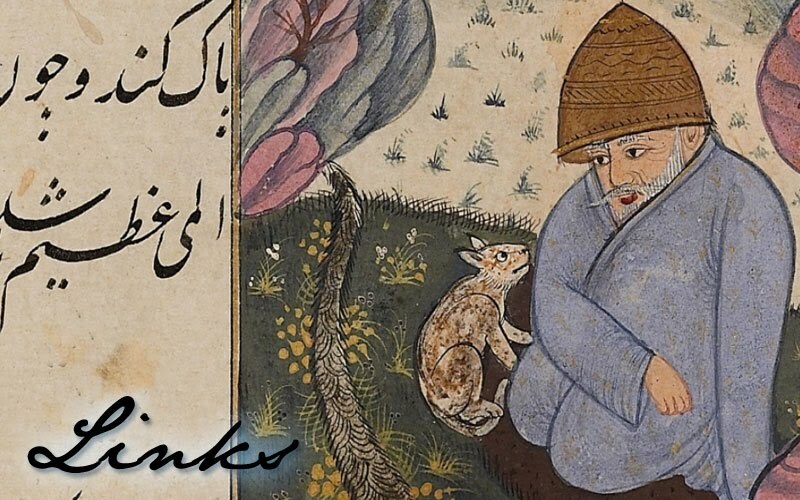 Audrey Truschke's Sanskrit and Persian Literary Cultures Online. Mitra Sharafi maintains a website resources for South Asian legal studies. Frances Pritchett's South Asia Study Resources. Chapati Mystery, focused on South Asian History, Pakistan, etc. Juan Cole's Informed Comment, focused on Middle Eastern politics. Bombay Railway History Group, documenting the history of the world's busiest transportation network. The Memory Palace provides compelling historical podcasts re-illuminating forgotten stories. Arts and Letters Daily, a service of the Chronicle of Higher Education. Memsaab Story, covering all things related to Bollywood nostalgia. Old Photos Bombay has some truly amazing and beautiful images of the city and its people. Parsicuisine.com has some excellent recipes for Parsi cooking when you don't have your copy of Time and Talents or Vividhvāṇī handy. Urvish Kothari's Gujarati World blog is an intelligently written resource to help keep abreast of literary and cultural life in Gujarat. Vahchef: the man who brought us Thanksgiving Turkey Biryani, and many other amazing creations.